Arrays contain all oligos to provide either PCR or real-time PCR according to customer´s design. 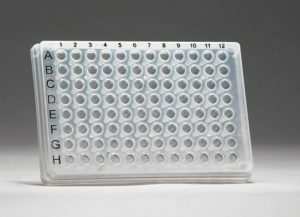 Oligos on array are recommended for providing high number of PCR tests paralelly on one microplate. After adding MasterMix + DNA sample, the plates are ready to use for PCR/real-time PCR. The main benefit of this layout is making time-consuming laboratory protocols simpler and faster. Price of the product is made up of both: price of oligos/probes involved in the array + price of the setup of the array.